This post continues to define certain key concepts and themes in human genetics. Basics of genetics are not discussed here. The focus is on identifying genes causing diseases, mechanisms of cancer and the impact of genetic diversity to drugs. The previous post can be found here. Pharmacogenetics studies how genes influence the efficacy and side-effects of drugs. It explains why different people react differently to medicines. 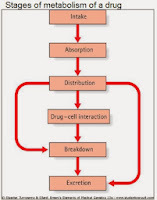 Other related terms are pharmacogenomics (the interactions between drug and the genome), pharmacokinetics (metabolism of drugs) and pharmacodynamics (the interactions between drugs and their molecular targets). 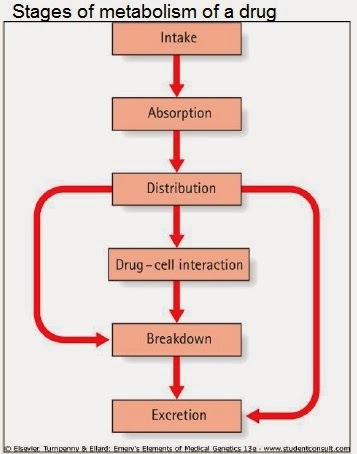 The response to a drug can be continuous or discontinuous. In continuous response, the responses are normally distributed, because the response is multifactorial (depends on genetics and the environment). In discontinuous response the genotype of the user defines the response, and there are only a few possible response types. Consider the stages of metabolism in the picture to the right. For example, homozyous recessive users (genotype aa) might follow the route distribution - breakdown - excretion, while homozygous dominant (AA) might immediately excrete the drug. For both response types the drug is ineffective. Heterozygotes (Aa) might metabolize the drug correctly. In this case, there are three possible responses to the drug. Drug metabolism occurs mainly in the liver, where glucuronide conjugation and acetylation are the most common mechanisms of metabolising drugs. Metabolism is usually two-phased: First a polar group is added to the drug molecule to make it water-soluble. This is usually due to P450 enzyme, and includes hydroxylation or oxidation.Then the drug is metabolised into an excretable product. This phase often uses N-acetyltransferase (NAT) or glutathione S-transferase (GST). Isoniazid is a drug used to treat tuberculosis. It absorbs quickly from the gut, and the level of isoniazid in the blood rises fast. The speed of metabolization depends on the enzyme NAT2, which has two alleles: fast acetylation and slow acetylation. Users homozygous for the slow acetylation metabolize isoniazid very slowly. For them the drug may cause liver damage and neural inflammation, because the toxic metabolites accumulate to the body. Certain genotypes concerning CYP2E1 and GSTM1 enzymes are also connected to slow metabolization of isoniazid and therefore hepatotoxicity. 50 % of West Europeans are homozygous slow acetylators. Some hemolytic anemias such as favism are caused by deficiency of the enzyme G6PD, glucose-6-phosphate dehydrogenase. It also causes sensitivity against primaquine, a malaria drug. G6PD deficiency is inherited as X-linked recessive trait. If G6PD deficient people use primaquine, they develop black urine, jaundice and low hemoglobine due to destruction of red cells. The condition is not lethal. The deficiency is very common in Africa where malaria is common, which may support the claim that the deficiency protects against malaria. Coumarin and other anti-blood-clotting drugs mut be very carefully dosed to each patient. There is extiensive variation between individual reactions to the drug, and a relatively high risk of severe bleeding complications if the dose is incorrect. Genes, ethnicity, the intake of vitamin K, diet, health and other drugs all have an impact on coumarin. Genetically the most important factors are polymorphism is CYP2C9 and VKORC1. The enzyme CYP2C9 has over 29 variants, and accounts for 15 % of all drug metabolism in the liver. Its most common variants are 20-70 % less effective enzymatically, and therefore need smaller dosages than fast metabolizers. VKORC1 is a vitamin K reductase, which reduces a by-product of blood-clotting factors into vitamin K. Vitamin K is essential in blood clotting. Warfarin, a drug similar to coumarin, inhibits VKORC1. More on dosing blood clotting drugs can be found from http://www.warfarindosing.org. diagnose cancer and determine most effective medication. Prenatal screening is mostly based on detecting non-DNA markers, which detect metabolic abnormalities. There are several methods for prenatal screening, such as chrionic villus samples,amniocentesis (sample of the fetal liquid), blood sample of the umpibical cord and endoscope visualization of the fetus. These are invasive techniques, and pose a small risk to the mother or the fetus. Non-invasive techniques include blood samples from the mother or ultrasonography. Ultrasonography, also known as ultrasound, can detect trisomies (Down synrdome, Patau syndrome, Edwards syndrome) or Turner syndrome, where a female has only one X chromosome. Ethical dilemmas arise from several factors. One is the clinical validity: how trustworthy the test is? Ultrasonography images and test results may show unclear results, subtle anomalies of unknown significance or offer mild indications of a disease. In which case should these findings be concidered strong enough to decide whether to keep or abort the fetus? Laws may dictate that abortion is either illegal or legal only under certain conditions. Invasive tests also increase the risk of miscarriage. Lastly, how to estimate the risk of anxiety if the test results are inconclusive, or a sick child is born despite negative test results? There is also a possibility that the result is erroneous, but it can be easily checked by taking another test. autonomy: the respect for privacy and absolute confidentiality. The patient is informed of the risks and validity of the offered test, and other options available. beneficence: the test is done for the best interest of the patient. non-maleficence: the principle of not doing harm. justice: fairness, equity of access and opportunity. This is especially important when concerning countries without government-supported healthcare, where all mothers should have equal opportunities to participate to gene tests. Gene therapy is the deliberate introduction of genetic material into human somatic cells for therapeutic, prophylactic or diagnostic purposes. Currently gene therapy is still only experimental, and tried mostly on cancers. No major breakthroughs have been achieved. Gene therapy can be either done on germline cells or autosomal cells. Germline mutations are permanent and inherited, due to which they are banned in many countries. 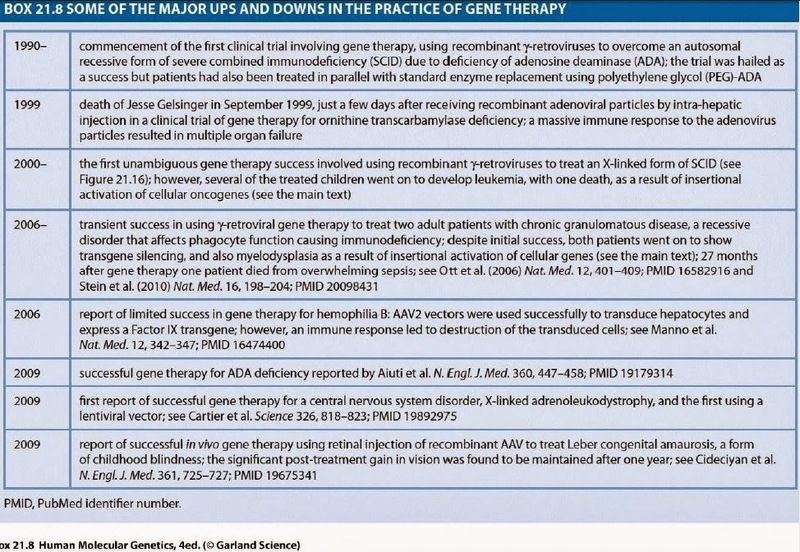 No current trials use germline therapy. Autosomal cell therapies aim to modifying specific cells or tissues of the patient. – Genetically modified vectors (viruses or plasmids). This is the most used technique, covering over 60 % of all gene therapy trials. The usability of a given virus depends on the amount of foreign DNA it can carry, how it interacts with the host genome and how the transgene is expressed. – Oncolytic viruses, which target only cancel cells, proliferate inside it and kill the cell after releasing new virusparticles to another cancer cells. For somatic cell therapy, the techniques can be divided into four methods. In gene supplementation a working copy of a gene is inserted to its target cells to treat loss-of-function conditions.Gene replacement replaces a mutant gene, and targeted inhibition silences certain genes. Lastly, gene therapy can be used for targeted killing of specific cells. In all cases the target gene can be inserted either directly to the patient cells (in vivo), or by growing and infection the patient's own cells with the target gene in a cell culture before injecting them to the patient (ex vivo). All the previous techniques can be used to treat cancer. Supplementation can restore tumor suppressor gene function. Inactivation can silence an oncogene, and manipulation of tumor cells can lead to apoptosis. Cells can also be made more antigenic, and thus promote the immune system to target the cancer cells. Cell killing can be done by using oncolytic viruses, which targets certain cells. Another method is the suicide gene therapy. In suicide gene therapy the cells are modified to turn a safe substance into a toxic one. For example, a retrovirus is modified to infect cells with herpes virus kinase. The virus is injected directly to the tumor, where it infects only dividing cells. When the cells have been infected, they are treated with a drug, which the kinase metabolizes into a toxic substance. The infected and drug-treated cells die. 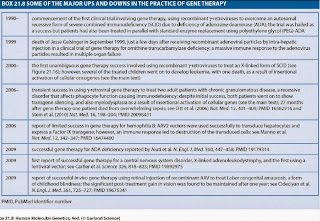 temporary effects: to be effective, some therapies need constant injections or "rounds" of gene therapy. immune response: patient's body may recognize the engineered cells and destroy them. Since the immune response is stronger in later infections, the patient may become immune to gene therapy. usage of viral vectors carries a risk of viral infections and mutated viruses in addition to possible toxicity and immune responses. multigene disorders cannot at the moment be treated with gene therapy at all. It is suitable only for monogenic diseases. RNA-therapy is a form of genetic therapy which uses RNA to affect genes and genetic expression. One example is the antisense nucleotide therapy used to treat Duchenne muscular dystrophy. Duchenne muscular dystrophy, DMD, is a genetic disorder of muscle weakness and degeneration caused by lack of dystrophin in the muscle tissue. DMD occurs in 1 of 3500 boys, and first symptoms occur in early childhood. Most patients die as young adults due to degeneration of breating and cardiac muscles. 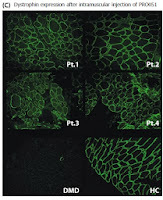 Dystrophin can be seen in tissue samples as a strong border around muscle cells. In DMD patients the stains show very little or no dystrophin, and the muscle cells are without real form or support. A milder version of DMD is the Becker syndrome, where the patients have a normal life expectancy. Becker syndrome patients have a partially functioning dystrophin, which can be smaller in size than normal, and/or have reduced abundance. The difference of DMD and Becker is caused by a genetic mutation. 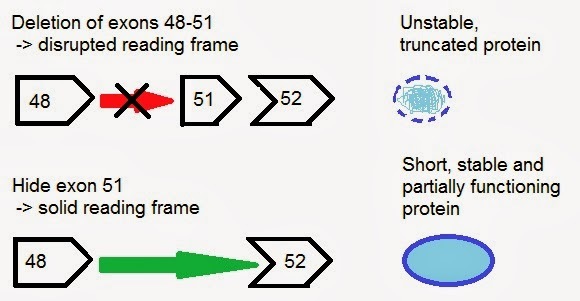 In DMD, the dystrophin protein has an out-of-frame deletion, which leads to an altered reading frame and eventually to a truncate and unstable protein. 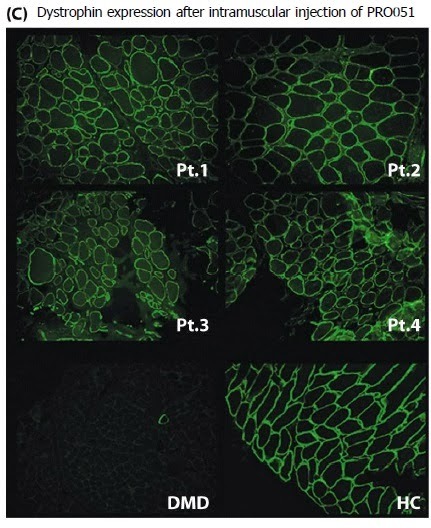 Becker patients have an in-frame deletion, which leads to a shorter but partly functional protein. The antisense oligoribonucleotide (AON) therapy targets at fixing the broken reading frame. 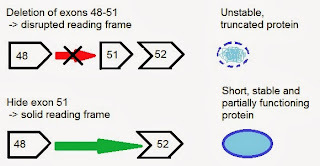 The deletion between exons 48 and 52 is severe, because the exons are not compatible. Therefore the spliceosome stops at the exon 48, unable to continue to 52. The gene therapy aims at bridging this cap. The antisense oligoribonucleotides are tailored to hybridize to exon 51 and hide it from the spliceosome. The exons 48 and 52 are compatible, so the spliceosome continues and runs to the end of the protein. The final product is a shortened protein, which is however party functional. Gene therapy does not cure DMD - it merely makes the disease milder and increases the lifespan of the patients. Currently gene therapy has been tested on 150 antisense oligonucleotides. The deletion of exons 49-50 is just one possible mutation causing DMD, and other mutations need their own oligonucleotides. First clinical studies have been performed on three AON therapy methods to hide the exon 51. One of these requires weekly abdominal injections. Down syndrome Trisomy 21 (47, +21). Can be due to translocation (t14;21) or t(21;21) or mosaicism. Extra chromosome often from mother Hypotonia, mental retardation, characteristic facial features, adult height of ~150 cm. Lifetime expectancy of 50-60 years. Patau syndrome Trisomy 13 (47,+13). Can be due to translocation (t13;14) - Central nervous system malformations, heart defects, growth retardation, cleft lip and palate. Most die as newborns. Edwards syndrome Trisomy 18 - Malformations in many organs, elfin features, mental deficiency. Most die within a week from birth. Klinefelter syndrome (47, XXY) Extra X chromosome(s) in males. Can also be (48, XXXY) or (49, XXXXY). - Taller than average, long lower limbs. All patients are infertile. Turner syndrome (45, X Lack of chromosome X in women - Short stature, infertility, no puberty. Great information thanks a lot for the detailed article. That is very interesting I love reading and I am always searching for informative information like this. I am very happy to your post about on. Great information, I would like to say your post is very informative.